Scouting the web for a premium smartphone from the house of Asus? Well, your hunt is over! Asus Zenfone 3 Deluxe is the kind of handset you have been looking for. It has everything from premium look and feel to high-end specifications availability. Let’s talk briefly about it to give you hint what it has to offer. Sporting a 5.7-inch 1080p Super AMOLED display, it has a pixel density of 386 ppi. The RAM and internal storage availability are quite high at 6GB RAM and 256 GB storage. As far as the camera is concerned, it comes equipped with best in class camera sensors at 23MP rear and 8 MP front. Camera is accompanied by a laser/phase detection autofocus and 4-axis OIS. This premium smartphone is powered by a Qualcomm Snapdragon 821 Quad-core processor, which clocks at 2.15 GHz. All this is powered by a 3000 mAh capacity battery. 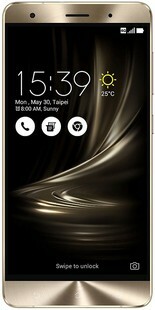 Asus Zenfone 3 Deluxe ZS570KL 256GB full specs and reviews as of Apr 2019. Buy it here!